Note: Remove the skin from chicken for an added health benefit. The coating will make it crunchy. Place buttermilk, 1 tablespoon salt, 1 tablespoon paprika, 1 teaspoon garlic powder, 1 teaspoon onion powder, cayenne pepper and chicken in a plastic container, shake thoroughly making sure seasoning is evenly dispersed throughout the mixture. Refrigerate overnight or for 24 hours. Line a cookie sheet with parchment paper or spray sheet lightly with oil and set aside. Drain chicken in a colander, 30 - 45 minutes. Combine flour, cornmeal, the remaining sea salt, smoked paprika, garlic powder, onion powder and thyme in a paper bag large enough to shake the chicken in. 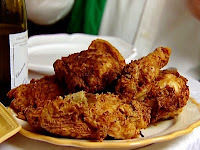 Shake off any excess buttermilk then place chicken in the bag 2 - 3 pieces at a time. Shake bag until chicken is coated then knock off excess breading. Place chicken on the prepared sheet pan. Space chicken in pan so that the pieces are not touching. If pieces are too close, it will prevent the heat from circulating around the chicken and stop it from becoming crunchy. Bake in a 350 degree oven uncovered 45 minutes or if you are using a meat thermometer chicken is done when the internal temperature reaches 165 degrees. There is no need to turn the chicken, both sides will brown. At the end of the cooking period, remove pan from oven and away from the heat. Let chicken rest undisturbed 8 minutes prior to serving. Use tongs when handling the chicken so that you do not poke holes in it and release the juices prematurely. Now tell me this chicken ain't finger licking good! For those of you who know me from the radio, you likely listen to my show Cafe Mocha. Recently this naturopathic doctor called interested in being a guess on the show. She said to me, "Forget breast cancer awareness. I think we're all aware cancer exists. I want to talk to your listeners about PREVENTION." I immediately thought, "I LOVE THIS WOMAN." Actually, I may have said it aloud. Yes, on the first date. I know so many people who are scared to death of getting cancer and other than the usual advice to eat right and exercise, I'm not hearing enough about what we can do to stop it from showing up in our bodies. Anyway, here are the tips she gave for prevention. 1) WATER: We always hear that we should drink water, but how much and why? Well, one of the obvious reasons is that our bodies are composed mostly of water, but what Dr. Brookshire explained is that water helps move the waste through the body, so it can be eliminated. As to how much, we are to drink half our body weight in water. Just so you get a reference point, 1pound = 16oz. Dr. Brookshire says most of us are already so dehydrated therefore the best way to get caught up on water intake is to drink 16oz every hour. This will change the blood in the body from sludge to a flowing river that will move the waste through your body for elimination. Which brings us to number 2. 2) PEE & POOP WHEN YOU HAVE TO: Dr. Brookshire and I got a good laugh out of this one, but it's not funny. We are all backed up and she says the problem is we want to take one more phone call or wait til we get to a clean bathroom. She says, "learn to squat." She's funny. The bottom line is when you have to pee or poop, do it. That is how the waste in our bodies gets eliminated. Holding it, keeps the toxins in. She says most of us are existing in a constipated state. If you're not pooping at least 3 times a day, then you've got a poopin problem. THE POOPIN STOOL: Mom and I were watching a rerun of Two and a Half Men and Jon Cryer's character had moved out and requested his pooping stool. Charlie Sheen's character retrieved a little white foot stool. Everyone else in the world was probably cracking up at this notion. However, I just stared at my mom blankly because we have 3 poopin stools, one for each bathroom. Why? Because they work. Mom got this from Dr. Oz. Placing your feet flat on a stool while on the toilet moves your intestines in just the correct position to ease out a bowel movement. I know it sounds crazy, but it works. 3) Digestive Enzymes: Now, I've read before that after 40 your body stops producing digestive enzymes. I didn't know what that meant or why we need to replace them. Dr. Brookshire explains that undigested food winds up floating around our bodies and attaching to our joints and becoming arthritis or attaching to an organ and becoming some other disease. So for those over 40, digestive enzymes are required. Heat olive oil over medium heat in the bottom of stockpot. Add onions and cook until soft, but do not brown. Add ginger, garlic and carrots and cook until fragrant, about 3-6 minutes. Add broth, orange & lemon juice and seasonings. 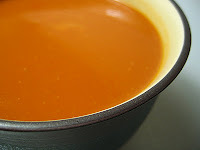 Bring to a boil, then reduce heat and simmer until carrots are tender, about 20-30 minutes. If using bay leaf, remove it from soup and discard. In batches, puree soup in blender [or in the pot with an immersion blender]. In a small sauce pan, combine the water, raisins, vanilla, cinnamon and honey bring to a boil. Add the oats stir and reduce the heat to low. Cook until water is absorbed and oats are tender, stirring occasionally. Stir in maple syrup and serve immediately. Note: If potatoes are touching, they will steam and have a soft texture. If they are separated, they will brown and have a crunchy texture. 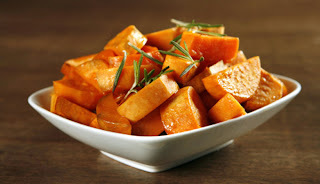 Do you know that yams and sweet potatoes are not related vegetables? Yams are native to Africa and are in the Lilies family and sweet potatoes are native to the Americans and are members of the Morning Glory family. Ok so they are not in the same family but they both have lots of fiber, vitamins A, B and are filled with beta carotene and they are interchangeable in recipes and they both are yummy. You are absolutely correct from your experience with sweet potatos and yam. Here in the US, our yams are just another variety of sweet potatoes. In reality, unless you purchased your yams from an African or Asian market, you have never tasted a real yam. So is there a difference in a “true yam” in nutritional value, taste or texture? Yep! First off, true yams often have brown or black skin with off-white, purple, or red flesh. They are starchier than sweet potatoes and have an earthy taste rather than a sweet taste. I don’t like them. Ooh so all that talk I heard about yams, fertility and hormones only apply to “true yams”? I started eating them because they say yams help regulate female hormones and can aid women dealing with everything from menstrual cramps to menopause. My understanding is all that scuttlebutt on yams only started because there is a high rate of fraternal twins among the Yoruba people in Africa; whose diet consists of a lot of yams. Scuttlebutt J Ange, I can’t believe you said that, you sound like grandma now. No! I sound like you, and that’s scary. You’re right it is rather scary! In answer to your question though, only the African yam has the composition that can impact on the hormonal supply. You know I’m too lazy to find a special African market for a “true yam.” For now, those yams/sweet potatoes I get at Trader Joes are just fine. They are still the number 1 all around most nutritional vegetable. And they taste great any way but candied. Now here is where we differ, you know I love candied yams and I have been experimenting with various recipes trying to make a healthy version without any success what so ever. Mom, why don’t you just admit it; no matter how hard you try, candied yams can never be healthy simply because of the word candied. The sugar, syrup and butter alone make it unhealthy. You crack me up with your organic yams, vegan butter and agave syrup. It’s still filled with sugar and fat. Yeah but you can’t blame me for trying. It’s just like mac & cheese, the nature of the dish is such that. . . well it’s fattening. That’s why our blog is called NEW AGE SOUL FOOD. It’s all about trying to find healthy alternative to old favorites. Even if we’re able to cut the fat in half, it’s worth it. Wouldn’t you agree? Yeah, you’re right. But you know me. I’ll take a sweet potato, nuke it and eat it plain. It’s a nice healthy, heavy snack. 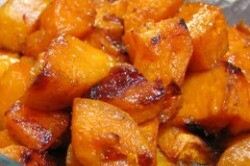 But here are Mom’s sweet potato recipes that are really very delicious. Each is a meal within itself. There’s an arms race going on, and it could mean disaster for your waistline. But this terrifying competition to build the biggest, scariest weapons of mass destruction isn’t happening between the United States and Russia, or on the Korean peninsula, or among angry rivals somewhere in the Middle East. It’s happening between America’s restaurants—every one of them, it seems, is eager to show it has the biggest, scariest, most destructive new food in the marketplace. And the unsuspecting victims of this Strangelovian contest? You and me. See, even the most well-established restaurant chains can’t rest on their laurels, serving the same old standbys that we’ve loved since we were kids. They have to keep us interested and attracted with shiny new bells and whistles. And since no one has invented, say, a new kind of potato, they’ve got to go with the next best thing: gimmicky entrees with terrifyingly complicated ingredient lists and rapidly expanding serving sizes. It wasn’t enough that pizza makers started putting cheeseinside the crust! Kentucky Fried Chicken saw that and ramped up its own destructive powers, by making a sandwich in which the bread is replaced by slabs of fried chicken. Then a few major league ballparks started serving their burgers on doughnuts instead of buns. What’s next: fried Fluffernutter franks? Almost. Take a look at what’s being whipped up in the labs of the mad fast-food scientists, compliments of the upcoming Eat This, Not That! 2011 book, and be afraid—be very afraid! Apparently, Denny’s deemed the classic grilled cheese too boring for our novelty seeking taste buds, so they fixed it by driving four deep-fried cheese sticks into the core of the sandwich. So what you end up with are cheese sticks with extra cheese between slabs of buttered bread and a pile of fried potatoes on the side. If Denny’s was serious about improving the grilled cheese, they would have skipped the novelty and brought in big-flavor ingredients like sautéed mushrooms or slicedfigs. But, of course, if they did that, they might not be able to sell this entire meal for $4. Here’s to cheap food and expensive health care! Further blurring the line between dessert and breakfast, IHOP has infused their fluffy flapjacks with gooey hunks of cheesecake. Next thing you know they’ll be serving breakfast with big scoops of ice cream and chocolate syrup. 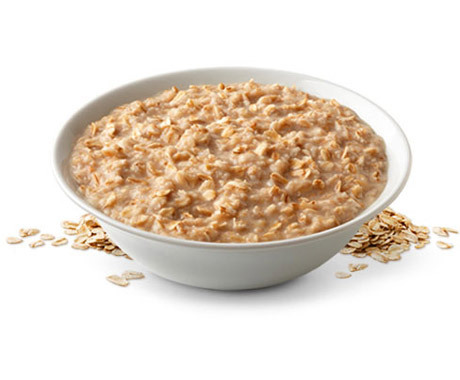 The best breakfast is one with protein and fresh fruit, but if you’re going to go for the carb-heavy indulgence, there’s a better way to do it. Don’t make it a habit, but IHOP’s Chocolate Chip Pancakes will save you 660 calories. Is this a joke? Because it should be. Where a normal hamburger has buns, this one has grilled cheese sandwiches. Yes, that’s two grilled-cheese sandwiches with one hunk of ground beef wedged between them. Other iterations of this sandwich have been dubbed “fatty melts”—for obvious reasons. They have twice as much cheese and bread as a regular cheeseburger. On its own, lobster is sweet, healthy, and loaded with lean protein. Yet, for some reason, restaurants never seem to know what to do with it. Case in point: Lobster BLT Pizza, an amalgam of foods that don’t quite fit together: One is seafood, one is diner grub, and one is an Italian-American hybrid. We're all for trying new things, but not when the toll is 75 percent of your day’s calories and 1½ day’s worth of sodium and saturated fat. Yes, America has a cheese fetish, but this is just excessive. Cheese-filled meatballs? It’s like a beef-based Gusher, a sort of meaty water balloon of fat. Especially problematic is the fact that said meatballs are served on a bed of fettuccine Alfredo, which is basically flat noodles basting in oil, butter, and—yes—cheese. Cut more than a thousand calories by switching dishes. A smart swap like this one (and the hundreds of others in Eat This, Not That!) a couple times a week and you can lose 2½ pounds a month without ever dieting! Line a cookie sheet with parchment paper or wipe lightly with oil. 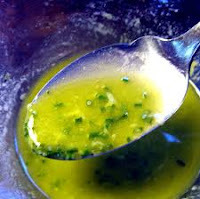 In a large bowl, whisk together all marinade ingredients. Add chicken and mix by hand to make sure that all pieces are completely covered with marinade. Cover bowl and let chicken marinade in refrigerator 2 hours. Or overnight. You are now going to make grill marks on the topside of the breast by using a grill or a grill pan. Then you will finish cooking the chicken in the oven. • Place the breast on a hot grill with the top (smooth) side down point the breast towards the 10 o’clock position. 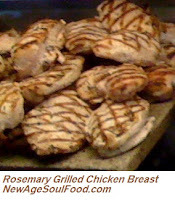 • Place breast on sheet pan and bake uncovered in the oven approximately 15 - 20 minutes. • By letting the chicken rest, you are allowing it to continue cooking. Chicken internal temperature must reach 160 degrees to kill pathogens and 165 degrees to be completely done. Please be aware that the internal temperature will rise 5 – 10 degrees in the first few minutes it is removed from the heat so let it rest and continue to cook before cutting. Note: Use tongs/spatula for handling any meat. A folk will pierce the flesh releasing the juices thereby causing it to dry out. Whisk together all ingredients, set aside. Cut the corn off the cob with a serrated knife. If you’re not ready to try raw corn yet, grill it first. 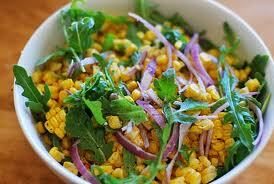 Mix the corn, red onions, thyme and Arugula together in a large bowl. Add dressing just before serving. Ok Ange, you know your mama loves you to death and I really appreciate you cooking for me. I am especially pleased that you took the time to buy fresh corn on the cob, but honey you boiled the corn to death. Wow! Okay. What do you want to do? Eat it raw? This is the way we’ve always cooked corn on the cob. And it’s such a sweet, delicious vegetable; you don’t need anything with it. Well yes, as a matter of fact, why not raw? But being the person that I am, we’ll compromise. Instead of boiling the corn to death, let’s grill it. 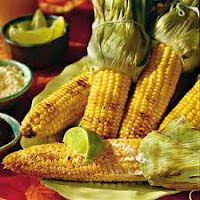 Grilled corn has a completely unique and different flavor and grilling is quick and simple. You’re right Mom. Why didn’t I think of that? In college we use to wrap the corn in aluminum foil and just throw it right on the coals. Grilled corn is delicious, but that’s a lot of trouble though especially if you’re not cooking out. Well if you don’t feel like grilling it, you can just throw it in the oven and bake it at 450-degrees until it’s golden brown. Or you can cook the corn directly on the burner of a gas stove. Ma, you know that drives me crazy. You’re the only person I know that would put food on an open flame indoors like we’re camping out or something. Ah hush; placing food directly on the burner is quite common. Just last week, I saw Maria cook her corn that way and Evelyn did her peppers like that also. But let me tell you one thing Ange, when you’re grilling on top of the stove you can never walk away because the food can burn in a second. Well let this be my official disclaimer. My mother’s a licensed and certified chef and her friends are crazy. Do not try this at home! Put it in the oven like regular non-cooking, sane people like myself do. Aw come on, you know my motto; “Variety is the spice of life”. Speaking of spice, let’s skip the butter and try something new and spicy made with a little olive oil. I’ll create a few simple recipes for us to try. I can get with that. I stopped putting butter on my corn years ago. It’s one of those ugly habits we’ve been doing for ages. Slathering the corn with butter and salt will just send you right to the doctor with high blood pressure and cholesterol. Plus, if you find fresh, sweet corn, it really doesn’t need anything else. Trust me. You know you’re absolutely right Ange. But you can’t expect folks to do away with the butter right away; you have to give them a good substitute. The ultimate goal is to eliminate butter completely and replace it with a healthy substitute like seasoned olive oil. I’m fine with just plain roasted corn. But, if you want something to spread on yours check out the Chili Lime and Lemon Chive Spreads. Whip up one of these babies and put it on your corn. If you’re looking for a great salad, try Mom’s Raw Corn Arugula, it’s yummy. If you find arugula a little bitter, substitute it with spinach, either way it’s good stuff. Whisk together all ingredients until it thickens and brush on each ear of roasted corn. Serve hot. Whisk together all ingredients until it thickens and brush over hot corn. Serve immediately. If using a grill - place corn directly on a hot oiled grill, grill 2 - 3 minutes on each side. Gas stovetop – pat the corn dry and place directly on the burner, turning so that all sides brown. It should take about 3 minutes. Keep a close eye on it so that it does not burn or catch fire. 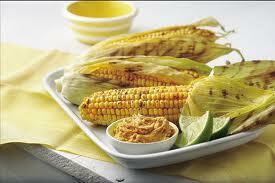 Using oven - rub corn with one of the spreads listed above or create your own. Place in a baking dish, making sure they are not touching and bake in a 450-degree oven. Turn so that all sides brown. Bake approximately 15 – 20 minutes. For the dressing: Whisk together all ingredients, set aside.